Climate change, and unusual weather may fall with a heavy hand on California agriculture: more frequent and more severe droughts; less water storage in the Sierra snowpack; increased pests and invasive species; heat waves; and reduced chill hours for fruit trees… all of which translate into fewer Full Belly peaches in your boxes? Yes, the peaches may be a problem, but because Full Belly is so diverse, we will try to pick up the slack with more melons and tomatoes. Setting the Full Belly specifics aside for a moment, people who think a lot about climate change talk about “ADAPTATION” — learning to live with it and reduce our vulnerability – and “MITIGATION” – figuring out how to limit the magnitude and rate of climate change by reducing emissions of greenhouse gases. In agriculture, we have to do both – and our CSA members can help us. By growing plants, farmers are using sunshine to combine CO2 from the air with water and minerals from the soil to produce food. Doesn’t this show that agriculture plays a role in reducing CO2 and other greenhouse gases? Many scholars say “no.” Common agricultural practices, especially soil tillage, tend to return very significant amounts of CO2 to the air, thus people point to agriculture as a source of greenhouse gases rather than a sink. On the other hand, the MARIN CARBON PROJECT has launched a “carbon farming program” that will apply compost to 100 acres of rangeland and monitor the long term results. PRELIMINARY RESEARCH INDICATES that carbon from the compost will move into deep soil storage quite quickly. 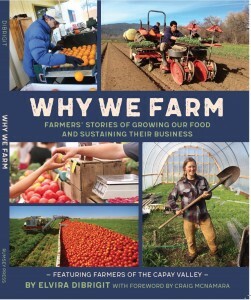 What if California agriculture, facing a converging web of challenges, is not able to cope, and we see more land fallowed (already water shortage has resulted in significant fallowing of Central Valley land), and more land turned over to city slickers? 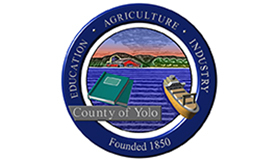 A 2012 study by UC Davis researchers found that in Yolo County, urban development generates 70 times more greenhouse gas emissions than irrigated cropland. What this ground-breaking study proved, was that protecting agricultural land, keeping it in farming, may be the very best strategy there is for preventing climate change. In response to these points made by farmers, scientists, and their non-profit organization allies, the state of California launched the first ever program to protect farmland in the name of mitigating climate change. The program is called the SUSTAINABLE AGRICULTURAL LANDS CONSERVATION PROGRAM. According to the Natural Resources Conservation Service, there are many practices that farmers can adopt in order to both mitigate and also prepare for climate change impacts: establishing perennial plants on any land that is not being cropped; reducing tillage; establishing hedgerows or other trees and shrubs on field edges; managing fertilization more carefully so as to reduce CO2 emissions; and much more. Now there is a piece of legislation, SB367, THE AGRICULTURE CLIMATE BENEFITS ACT, that if passed, may increase the number of farmers that use these climate-friendly practices. This bill, by Senator Lois Wolk, will create a grant program to support on-farm climate-friendly practices, plus it will expand the California program dedicated to keeping agricultural land in agriculture. The grant program would support on-farm projects that incorporate soil-building practices; promote irrigation efficiency and water conservation; generate on-farm alternative energy and increase energy efficiency; and provide for wildlife habitat conservation. The bill is asking for $50 million from cap and trade funds to be dedicated to this effort. Full Belly Farm is supporting this bill. We hope that our CSA members will agree that it is a very exciting opportunity, and will support it as well. The bill has passed through the Senate Agriculture Committee and the Senate Environmental Quality Committee with unanimous bipartisan support. In late May or early June, it will be considered in the Appropriations Committee where the financial implications of allocating cap-and-trade funds to agriculture will be considered. After that, it will go to the full Senate, and we will need support every step of the way. You can send a letter of support, or provide other types of support for this bill. For ongoing information and updates, visit:HTTP://CALCLIMATEAG.ORG/SB-367/. The bill is co-sponsored by California Climate and Agriculture Network and the Community Alliance with Family Farmers. Thanks to CV Farm Shop of reposting the original article from the FBF newsletter.